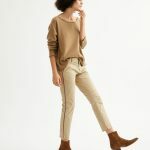 The army green pant is another item I’ve never included in a list of classics,but probably should—they are easy to wear, fun, and versatile as the day is long, and look as good with a tee as they do with something a little more dressed up. I like them on the slouchy side and typically size up for this reason. 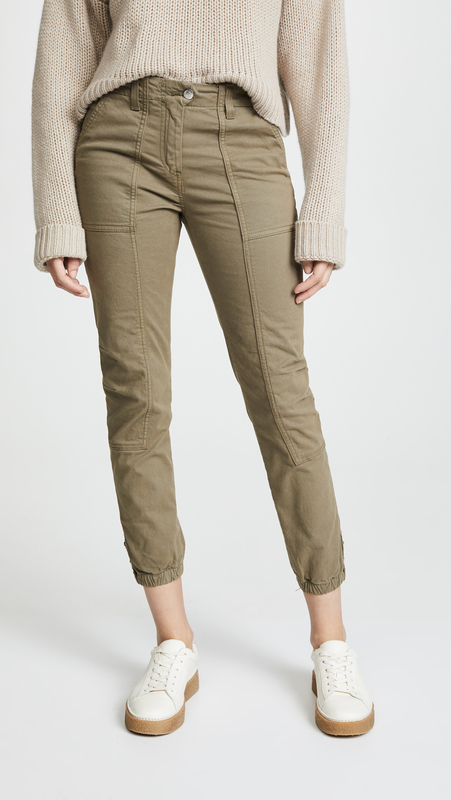 I like the cropped length and clean lines of this pair from Theory. A drop-crotch pant is definitely not for everyone, but I like them for kicking around on weekends. 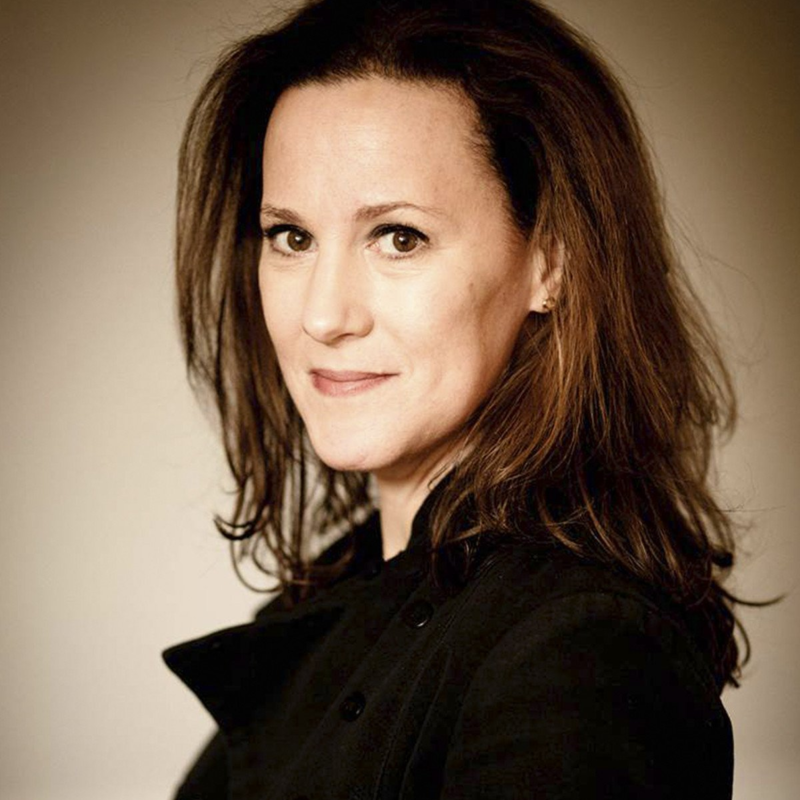 The waistline on this pair from Veronica Beard is high but not too high, which is key. 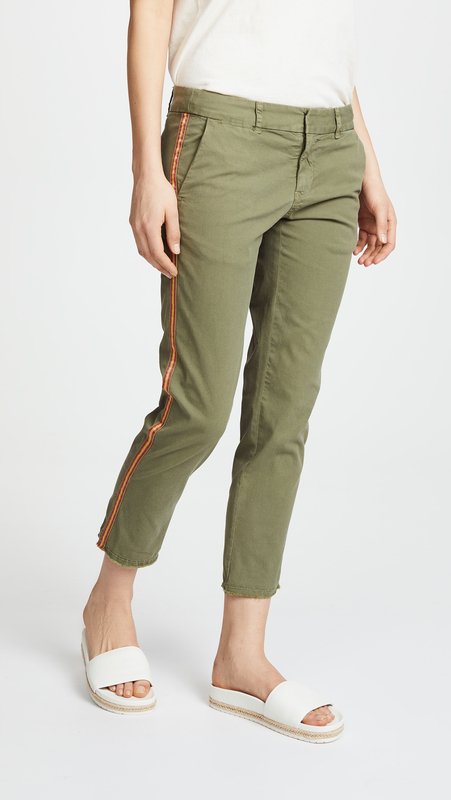 I love the colorful ribbon down the seam of this Nili Lotan pair, and that they’re cut like chinos. Here is a (somewhat) similar and cheaper pair. And here is an extended sizes pick, nicely priced. 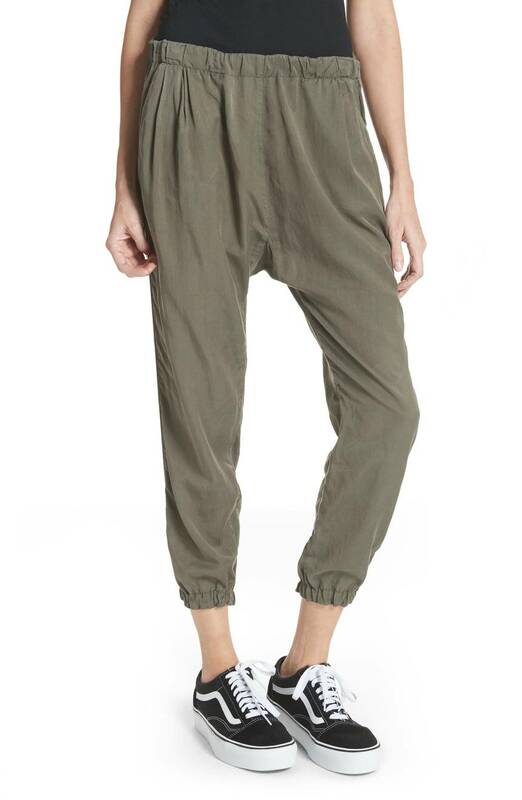 I looove my army green pants (have 4 pair), perfect for spring and all through summer. I agree, they are a classic. Not cropped, though. Slouchy, but not cropped. 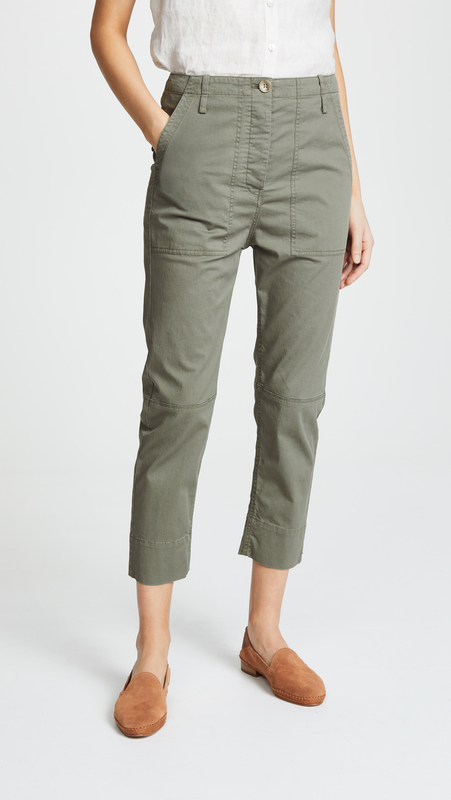 I looove my army green pants (have 4 pair), perfect for spring and all through summer. I agree, they are a classic. Not cropped, though. Slouchy, but not cropped. I was apparently fated to have my first pair, because they were actually a J Crew order mix up. I bought some kind of swimsuit cover-up that I didn’t need, and instead, they sent a pair of army green men’s chinos that actually fit me perfectly. I accepted that this was a much more practical item, and kept the pants. Hmmm, I should wear those today…. I am eyeing the platform Vans. Hmm. Cosmic! I am eyeing the platform Vans. Hmm. I love them, too – definitely a staple. I usually buy mine from Eddie Bauer. I love them, too - definitely a staple. I usually buy mine from Eddie Bauer. Loooooooove! I have 4 pair! The cargos in the first photo are perfect. Who makes them? I agree, no to cropped cargos. Yes, they are perfect! Need to know where to get those! Yep, love them, but have yet to find a pair to fit me perfectly (or even close enough to have them tailored a bit). Will stay away from the drop crotch––at my age it looks like I’ve left room to house my adult diaper. Yep, love them, but have yet to find a pair to fit me perfectly (or even close enough to have them tailored a bit). Will stay away from the drop crotch––at my age it looks like I've left room to house my adult diaper. Yay! These are pretty much my go-to pants, and sooo happy that there is an uncropped version. The H&M ones look just like my beloved Joe Fresh ones that have faded terribly. I love these pants! They are great for hot weather, for those of us who want leg coverage, even in the heat. I love army green pants almost as much as I love army green shorts. I have had a pair of both in rotation every summer without fail since 1981, and no plans to stop. 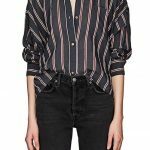 Slouchy is key! 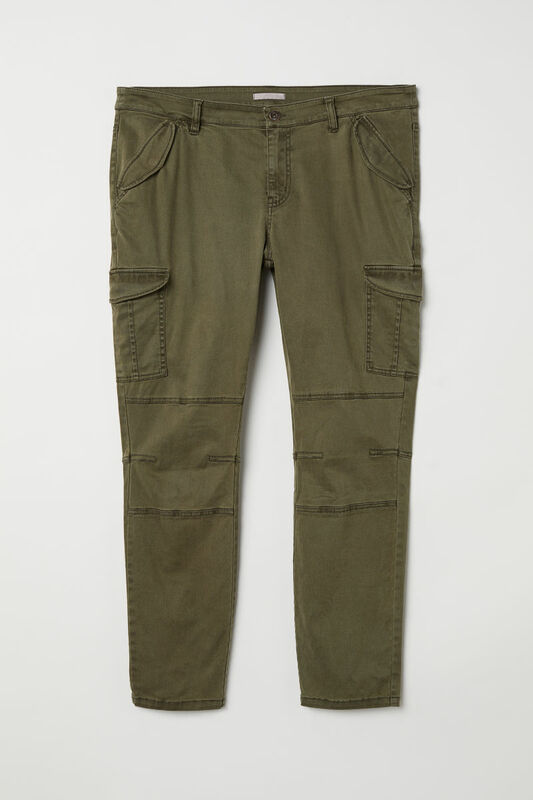 I’m very particular about the features on my Army green pants: Flat cargo pockets (so they don’t add thigh-ness), mid-rise, ankle bone length, no elastic in the ankles, nice sized tortoiseshell button at the waist, and the perfect shade of green. I know it when I see it.